If you want to raise chickens in your backyard, you will need a coop. The coop is the structure in which they will retreat at night to roost, or get as high as they can off the ground. The difference between a fly pen and a run pen is in the height. In a fly pen, the chickens will have room to fly. In a run pen the height is just barely enough to keep them out of reach of a predator's paw. 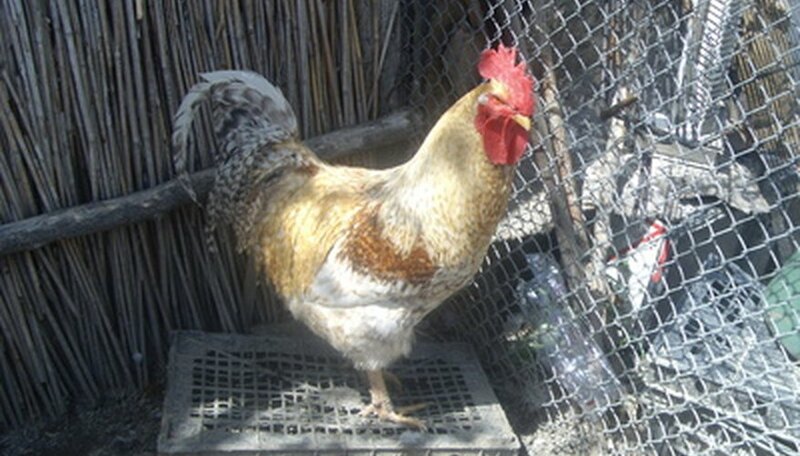 A tie cord is a string tied to the leg of a rooster that is meant to keep it from fighting other roosters. A typical fly pen would be 8-by-10 feet and eight feet high. Measure the height and width of the coop you are using. A fly pen ideally backs up against the existing chicken-coop structure and should be tall enough for you to be able to walk around in. If you are using a small-sized coop, you may want to consider surrounding the coop with an outer structure of the fly pen. If the coop you own is of a decent size, you can use the top edge of the coop roof as a guide to building the top of the fly pen. Calculate the number of square feet for the fly pen. For each chicken in the pen, there should be ten square feet. Use these measurements to cut the wood in the right sizes. The 2-by-10s will form the foundation and top supports on the left and right sides of the fly pen. The 2-by-8s will form the height supports on each of the four corners and the length braces on the top and bottom of the pen. Set one of the 2-by-8s flush upright with one end of a 2-by-10. Using a drill and screwdriver bit, secure the 2-by- 8 to the 2-by-10. Use a corner brace to strengthen the connection. Repeat with another 2-by-8 on the other end of the 2-by-10. The structure should resemble the upper portion of a goal post on a football field. Secure a 2-by-8 in each bottom corner of the "goal-post" shaped structure. Use at least three carpenter's screws at each corner. Erect the remaining 2-by-10 pieces and secure one to each remaining corner with at least three carpenter's screws and a corner brace on each corner. The structure should now resemble a box with no lid. Make a mark on each 2-by-10 about 5 feet up. Secure a 10-foot' wooden brace on the front, the left and right sides of the fly pen with carpenter's screws at these marks. These braces will serve as extra support for the chicken wire to prevent predators from forcing their way into the pen. They can also serve as handles for moving this relatively lightweight pen. Staple the lead edge of the roll of chicken wire to one of the corner 2-by-8s. The closer together the staples are, the more difficult it will be for a predator to get in and for a chicken to get out. Staple the wire at intervals on the wooden braces as well. Unroll as you staple to cover the front, the left and right sides. When complete, use the wire cutters and cut the remainder of the roll off of the frame. Push against the wire to test the strength. Tilt the structure over so that you can reach what will be the "Top" of the pen. Secure the remaining 2-by-10s to the left and right sides of the "top" of the pen with carpenter's screws and corner braces. Connect the four 2-by-10s on each corner with the remaining 2-by-8s, using carpenter's screws and corner braces. The structure should now fully resemble a "box." Measure a section of chicken wire that is eight feet long and 10 feet high and secure this as the "top" of the pen with the staple gun. Tilt the pen back over to the previous position. Move the pen to the front of your coop with the open end facing the door to the coop. If the coop is shorter than the eight foot height of the pen, use the remaining chicken wire to fill in spaces where a predator could get in or a chicken could get out. Reduce measurements for the fly pen height by half to successfully build the run pen, which only needs to be tall enough for the chickens to safely leave the shelter of the coop. For the tie cord, it only requires a plastic tag that is secured to the rooster's leg and a tie cord secured to the ground much like a dog tie is. This keeps territorial roosters from fighting each other when they are in the same yard. To build an entire coop for one rooster would be expensive.